Situated in Pondicherry, this spa hotel is 1.1 mi (1.8 km) from Botanical Gardens and 1.3 mi (2.1 km) from Sri Aurobindo Ashram. Arulmigu Manakula Vinayagar Temple and Raj Niwas are also within 2 mi (3 km). Located in White Town, this beachfront hotel is in the city center and within a 15-minute walk of Pondicherry Lighthouse and Sri Aurobindo Ashram. Pondicherry Museum and Raj Niwas are also within 15 minutes. Pondicherry-Puducherry Station is 10 minutes by foot. 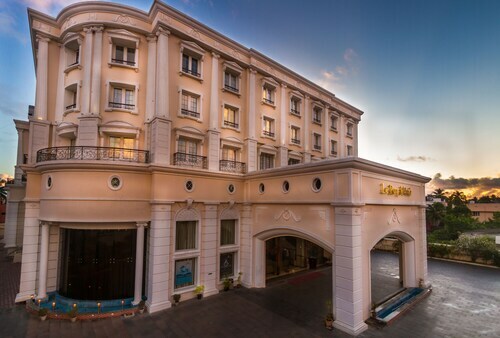 This family-friendly hotel is located in the city center, within 3 mi (5 km) of Botanical Gardens and Sri Aurobindo Ashram. Arulmigu Manakula Vinayagar Temple and Raj Niwas are also within 3 mi (5 km). Situated in Pondicherry, this spa hotel is within 1 mi (2 km) of Arulmigu Manakula Vinayagar Temple and Sri Aurobindo Ashram. Raj Niwas and Pondicherry Museum are also within 1 mi (2 km). Pondicherry-Puducherry Station is 26 minutes by foot. How Much is a Hotel Room in Kalapet? Hotels in Kalapet start at $34 per night. Prices and availability subject to change. Additional terms may apply. If you are researching a vacation in Pondicherry and seeking a place to rest and relax in Kalapet, you'll find that there are a great range of options. Travelocity's booking portal at present contains 12 places to base yourself within a short drive of Kalapet. The The Ashok Beach Resort is a much sought-after hotel choice due to the fact that it is so close to the heart of Kalapet. The Palais de Mahé is about 7 miles (12 kilometers) away from downtown Kalapet. Another option is the Ocean Spray, which is positioned 3 miles (4 kilometers) away. Alternatively, you may like to make a booking at the Dune Eco village and Spa or the The Promenade. Once you've seen Kalapet, make the trip to explore the many activities of the Pondicherry area. Check out Pondicherry's old towns, churches and cathedrals. You should take the time to admire its beaches. Enlightened travelers in this corner of India often love mountain biking and hiking. The nearest places to spend the night in Pondicherry include Poornankuppam and Kuilapalayam. Poornankuppam is 14 miles (23 kilometers) to the south of Kalapet, while Kuilapalayam is 3 miles (5 kilometers) to the south. 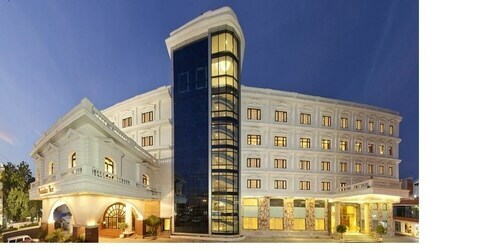 Poornankuppam Travelocity-listed hotel establishments include the Club Mahindra Puducherry and Kailash Beach Resort. 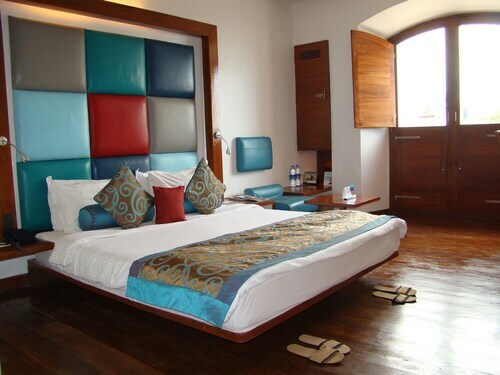 The Ginger Pondicherry and The Ashok Beach Resort are a selection of the Travelocity-listed rooms in Kuilapalayam. If you can't stop thinking about sport and love attending local games you could spend a day at Mayajaal Sports Complex, which is found 60 miles (100 kilometers) to the northeast of Kalapet. Find a Travelocity-listed hotel right by the action at the Kohinoor Asiana Hotel or the Gokulam Park Sabari OMR Hotel. 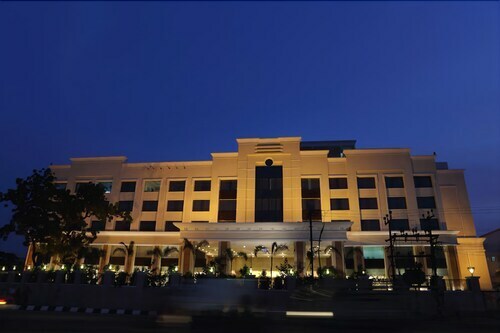 For those travelers flying through Chennai International Airport, you might choose to book Travelocity-listed accommodation at Trident, Chennai, or Hilton Chennai, which can both be found conveniently located nearby.